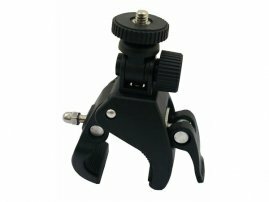 Motorcycle / Bicycle Handlebar Mount for Camera / BlackBox / DC / SLR / DSLR [AP002514] - $9.45 : allputer.com - Accessories for all your Portable Electronics & Computers! Want a black box for your motorcycle? Want to capture what you see when you are on the road with your motorcycle? This robust threaded mount is specially designed for Motorocycle (and also bike with large handlebar). It is tighted by a stainless steel thread that the clamp a handlebar up to 35mm (or 1.5") with a standard 1/4"-20 mounting stud. No modifications needed to use this heavy duty mount. - Special design so you can set your camera to any angle that fits (horizontally 180 degree or left to right adjustable). - This is also suitable for mountain Bikes with large handlebar. - This mount is not designed to use with aggressive or extreme bicycle riding / Motorcycle driving. - We assume no responsible of liability for the Camera / Video Recorder or operator of the Motorcycle / bicycle if the device is used while cycling / driving. - Screw: Diameter 1/4" - 20 unc. - Handlebar size: 16~40mm (or 1 1/2") max.